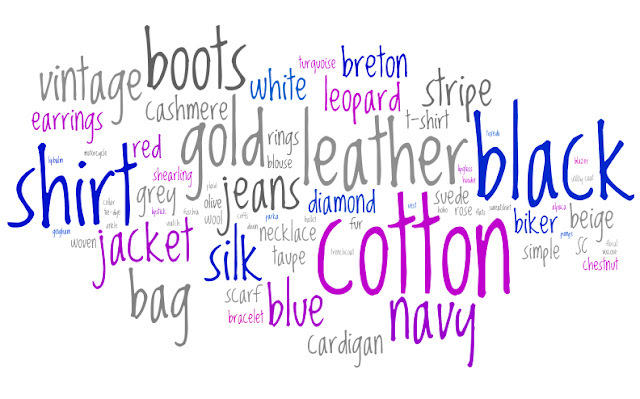 my closet essentials, by wordle via lin's excellent blog. quite accurate! ha! if this is the stream of consciousness of my blog in visual form, well, it's pretty right on. if you have a blog, what does your cloud say? It's on danish, but the most common word is "I" haha. hehe! your cloud font is really cool. thanks for stopping by and for commenting! mine came up a bunch of vietnam stuff, hahaha. which is not exactly representative. but it was fun to see noodles and balloons floating around randomly. btw, looove your SC bag! noodles! balloons! that's kind of ideal for a cloud eh? arrrgh i should have brought my SC with me to SH! mmm i agree with so many things on here. it's definitely a nifty app! I love how 'ONE' is such a huge word here! hehehe. 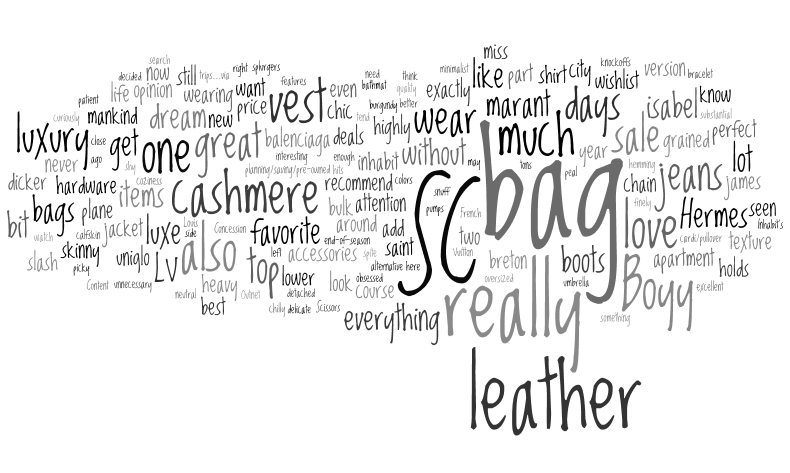 i'd love to see what your blog wordle looks like! Wow this is so much fun! Although I dislike how it picks up the words I usually rely on to write such as 'really' or 'like' or ... you get what I mean! i like that HONG KONG figures so prominently - it's so central to your inspirations and style! I'm a fan of vivienne files but lapsed my attention.I will try it anyway.Thanks for sharing. this is so cool. I tend to have such verbal diarrhea on my blog though I can only imagine my words would not make any sense at all.